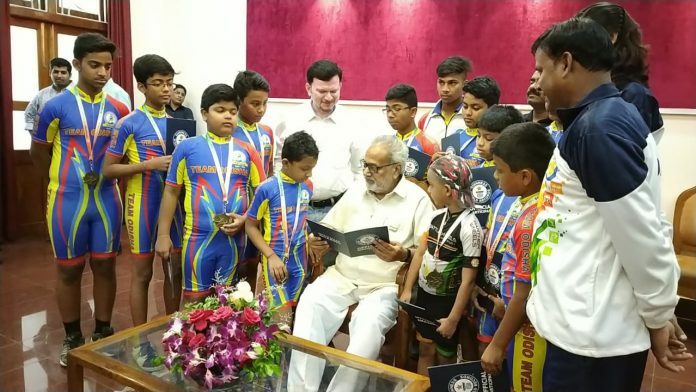 Bhubaneswar: Governor Ganeshi Lal here on Saturday felicitated the 13-member Odisha Roller Skating Association (ORSA) team, which entered the Guinness World Records for 48-hour non-stop roller skating at Belgavi in Karnataka on November 10, 2018. Five hundred and forty-five skaters from various states of India participated in this international event. The ORSA team has skaters from various districts of the state. ORSA is the apex state body for roller skating sports, recognised by the Sports and Youth Services Department, Odisha Council of Sports and Odisha Olympic Association. Coach Panchanana Behera and ORSA Secretary, Partha Sarathi Jena were present at the felicitation ceremony. Polavaram Project Enters Guinness World Records, Odisha Not Impressed!